Let God arise, and let His enemies be scattered, and let them that hate Him flee from before His face. Today Christ, our saving Pascha, hath been revealed unto us a noble Pascha; the Pascha new and holy; the mystical Pascha; the Pascha all august; the blameless Pascha; the great Pascha; the Pascha of the faithful; the Pascha which openeth unto us the gates of paradise; the Pascha which sanctifieth all the faithful. As smoke vanisheth, so let them vanish; as wax melteth before the fire. O come from the vision, ye women, heralds of good tidings, and say ye unto Zion, Receive from us the glad tidings of the joy of the Resurrection of Christ. Rejoice, O Jerusalem, and leap for joy, in that thou beholdest Christ the King like a bridegroom come forth from the grave. So let sinners perish at the presence of God, and let the righteous be glad. When the ointment-bearing women stood, very early in the morning, before the tomb of the Life- giver, they found an angel sitting upon the stone. And he cried out unto them, saying, Why seek ye the Living among the dead? Why mourn ye the Incorruptible amidst corruption? Go, proclaim the glad tidings to His Disciples. This is the day which the Lord hath made; let us rejoice and be glad therein. The joyful Pascha, the Pascha of the Lord, the Pascha all majestic hath shone upon us! 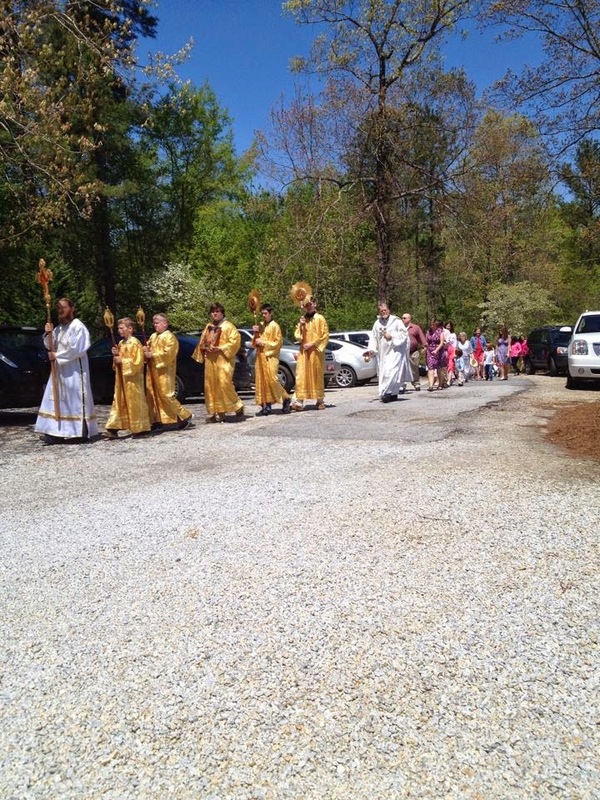 The Pascha in which we embrace one another with joy! O what a Pascha, delivering from sorrow! For today from the tomb, as from a chamber Christ shone, and hath filled the women with joy, saying: Proclaim the glad tidings to the Apostles. Today is the Day of Resurrection! Let us shine with the Feast! Let us embrace one another. Let us say, Brethren! And because of the Resurrection, let us forgive all things to those who hate us, and in this wise, exclaim: Christ is risen from the dead; trampling Death by death, and upon those in the tombs bestowing life. Is it traditional for people to embrace each other after the agape vespers? I'm actually not sure on that one, Matthew. We don't, but that doesn't mean it's not traditional. I haven't heard of the practice. Is it possible you're thinking of Forgiveness Vespers? 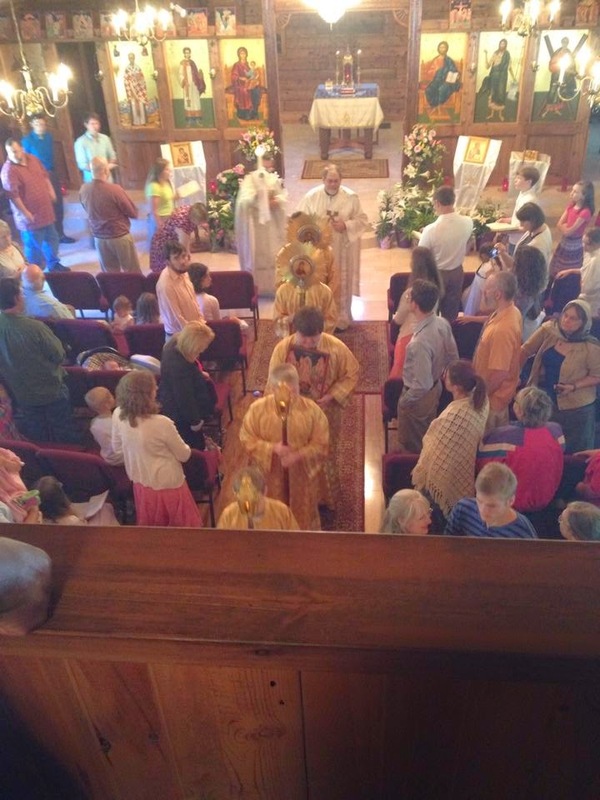 Great and Holy Pascha! Christ is Risen!